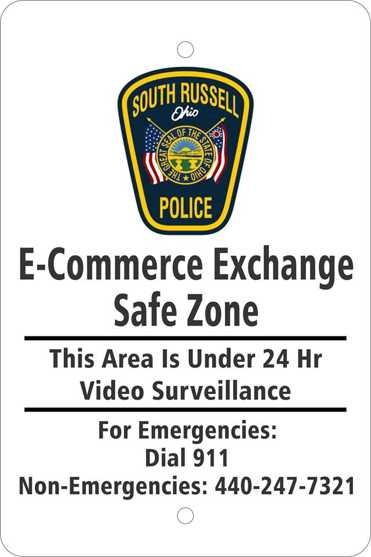 The South Russell Police Department has implemented a new “E-Commerce Safe Exchange Zone” located in the visitor parking area of the Police Station. This safety zone provides a safe place for citizens to make purchases or exchanges after conducting online transactions. E-Commerce safety zones are becoming quite popular and well received in their respective communities. The safe zone allows citizens to make transactions in public, with peace of mind in a highly-visible location without fearing for their safety. The Police Department’s security monitoring system operates and record events 24 hours a day. Anyone using the safety zone will be recorded from the time they enter the campus until the transaction is completed and they depart the campus. This service requires no police response and simply provides an area which is monitored 24 hours a day. Should an emergency occur, citizens can be instructed to call 911 or activate the “call box” at the entrance to the Police Station.